As part of the reEarth project, a group of researchers fronted by William Victor Camilleri and Danilo Sampaio from the Interactive Architecture Lab at University College London, have created the “Hortum machina B” – a rolling ecological exoskeleton. 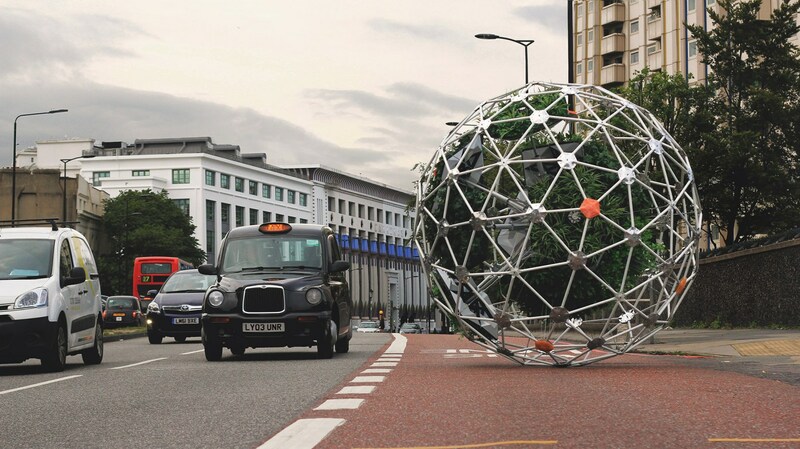 “Half garden, half machine,” Hortum machina B is a “new cybernetic lifeform” that has been rolling round London’s streets, relying on the intelligence of plant life to guide its way through the capital. Consisting of twelve plant-based modules derived from a British ecological background, protruding arms extend to alter the module’s center of gravity allowing it to move in the direction of choice. While this may sound like a painfully laborious way of getting around, Hortum machina B sheds light on the possible future of “bio-cooperative interaction between people and nature, within the built environment”. Electro-physiological sensors measure the state of individual plants, facilitating the collective and subsequently “democratic” decision making that the module undertakes. Inside the structure, a robotic “brain” is made up of electrodes that receive sensory information from the physiological responses of the plants to their environment. As a result, information processed from the electro-physiological sensors (in relation to every other sensor) essentially dictate the module’s orientation and mobility. For example, a plants’ reaction to a change in either light, humidity, and temperature is transmitted to a sensor which relays that information to the robotic brain core which then, after taking into account all the other information it is being fed, decides what to do. The Hortum machina B also signifies another step in the direction of autonomous mobility, though in this case using plant-life as the primary sensory “driver”. “Hortum machina B is a speculative urban cyber-gardener,” the group say.